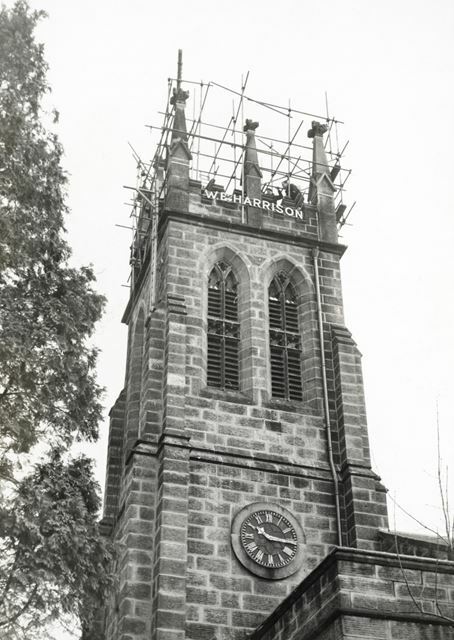 Repairs to the tower of St Thomas's Church following serious damage that occurred during a gale in February 1962. The contractor for the work was W E Harrison. A local newspaper report published in 1967 stated that 'Intricately carved stone pinnacles now standing on the tower of St Thomas's Church, Brampton, near Chesterfield, mark the near end of a five-year fight to make good damage caused by the great gale of 1962. In those violent February days, one pinnacle was blown off the tower. It crashed through the roof of the church and smashed pews. The church was repaired quite soon afterwards, but wheen the tower was examined, worried church workers were told that pinnacles had been damaged and had been cracked by iron dowels which had rusted and expanded inside the stone. But now, thanks to the response to a public appeal, restoration work which began on the tower last summer, is almost complete. The tower's eight pinnacles, one of them completely new, and others restored in part, have been erected exactly as before. Work will probably cost £2,000 and the appeal has so far raised £1,400'.